Bonneville pressurized the lake bottom. As Lake Bonneville evaporated, and receded over time, forming the Great Salt Lake, it left a compressed residue of salt and sand, the Bonneville Salt Flats. One hundred and fifteen miles west from Salt Lake City on Interstate 80, five miles east of Wendover, NV is the Bonneville Salt Flats Rest Area. Pulling into the parking area there is a Toyota pick-up parked to the left of my parking space. A father and son are unloading mountain bikes. On the right a mother is unbuckling three small children from their seats in a white van. I grab my lunch and call my Sadie dog to come. We head for a covered picnic table. 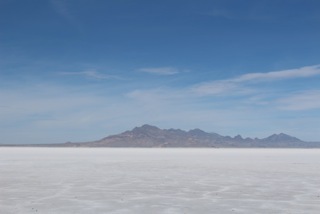 Sadie finds a spot to sit and looks out across the creamy white salt flats. I watch the two on bikes ride off across the flats until they are invisible. The day is hazy and unusually warm for mid March. I scan the range of mountains to the north and across the endless stretch of white to see the three small children running at quite a distance out on the sand. They are tiny specks in motion. Their mother stands on the ancient shoreline watching. Lunch finished, I return Sadie and lunch box to the car and get my camera and a sketchpad. There is a rest stop sign telling that across the flats, in front of the mountain range is Utah’s famed measured mile, where world land speed records have been set. Glancing out across the distance the guys on bikes are heading back. Soon they will be back in their truck and gone. The mother with small children has returned to their van. The are getting back on the interstate with miles to go. I walk to the place where they had been on the sand shoreline. 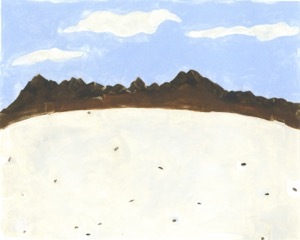 The white sand flats are speckled with small dark pebbles. There is a good view of the mountains from there. I do some drawing and photography and looking down, in the sand where the mother had been standing, written in small black pebbles in the white sand is the date, 3/16/2015. This entry was posted in American West. Bookmark the permalink.